The Tanoshiboy Chronicles: Design & Illustration Blog: "We are poison to you Spider-man!" "We are poison to you Spider-man!" I just felt like drawing a bad guy and lately I haven't really liked the Mac Gargan version of Venom. I miss the original Eddie Brock one. But Brock's spending his days as Anti-Venom these days. Couldn't come up with a better name guys? Really? 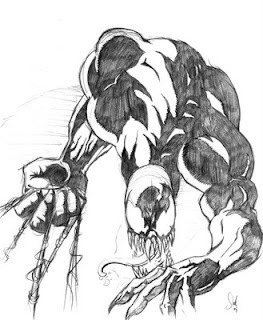 Anyway, I skipped the spider on the back cause I kind of like the Ultimate universe venom without the insignia. Hopefully, Eddie will return to his Spidey hating days, but for now I can still enjoy him in old comics or the recent mini Venom: Dark Origin. Check it out if you get a chance.